Mrs. Lincoln's Inkin: Congrats To You!!! Today's share is of a Congratulations card that I made. There are bright and fun colors all through this card. The base of the card is in Whisper White and measures 4 1/4" x 11", scored at 5 1/2". I then took a piece of Rich Razzleberry which is cut at 5 1/4" x 3 and topped it with a polka-dot piece from the Brights DSP Paper Stack that measures 5" x 2 3/4". I love the way that yellow's and purples look together. The balloons are using the same paper stack and are punched out using the Balloon Punch. And of course to add some "bling" i used a balloon in the Dazzling Diamonds Glimmer Paper. *For every $50 you spend, before s/h and tax, you will receive a "coin". So, if you spend $100 with me, right there is 2 coins. This is something that I am going to keep track of so there is no worry and hassle for you. 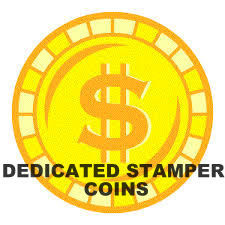 Once you have reached 10 Coins you will receive a free stamp set from me of your choice! Any stamp set that you want, regardless of the price. Please keep in mind that this does exclude and hostess sets, Sale-A-Bration sets (when available) and bundles. Once you receive your 10th coin, I will ship your stamp set as well as a Thank You note to you personally! I hope that this shows just how much I appreciate all of my loyal customers. It's just my way of saying thanks.